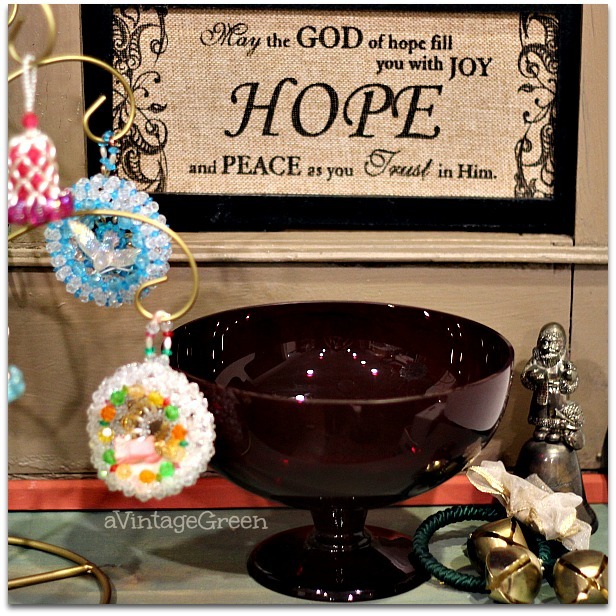 This month my vintage sharing is a mixture of re-finding, thrifting, church sales and repairing. I stencilled words (very pale grey) in several areas and the problem area blends in now. The vintage Round Gong hanging from a frame mounted on a Rosewood base has a 'married' striker which I painted black and waxed. 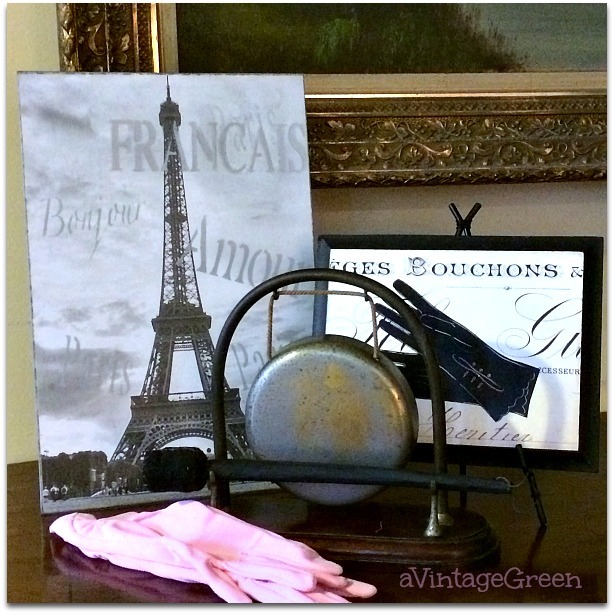 A small french sign with glove picture needed the black refreshed and waxed (and the back painted/waxed). The thrifted pink gloves added a bit of romance to the picture. DH brought home this lovely curb find barn red chair and I tried out a new (to me) stencil from Michaels in Dover White. Sequence: picked out the stencil, used green tape and a ruler to carefully position stencil (then discovered the pending repair under the chair). Used Dover White chalk type paint and my short stencil brush. Carefully lifted stencil up from the chair. Removed tape, washed stencil, cleaned brush, put away supplies. Waxed entire chair and polished, then discovered that the plywood on the back was separating (likely because it was a curb find and rainy weather and had been in our home drying out for a few days) so DH glued, found another area separating, glued etc. until the back was ok. The metal frame below is an old find, unearthed while looking for something else. Added a graphic from Graphic Fairy and a new backing using cardboard after I added a piece of keys pattern scrapbook paper from Michaels. 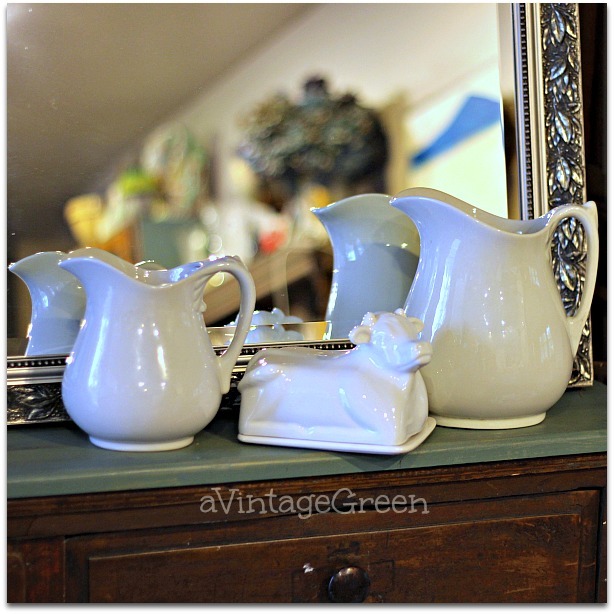 The two jugs look very similar, one is vintage and one is a repro. The cow butter dish is new. The vintage jug is the large, on the right. Night photos are not my first choice but I can live with the result. Very different bottom markings. Love finding ironstone. 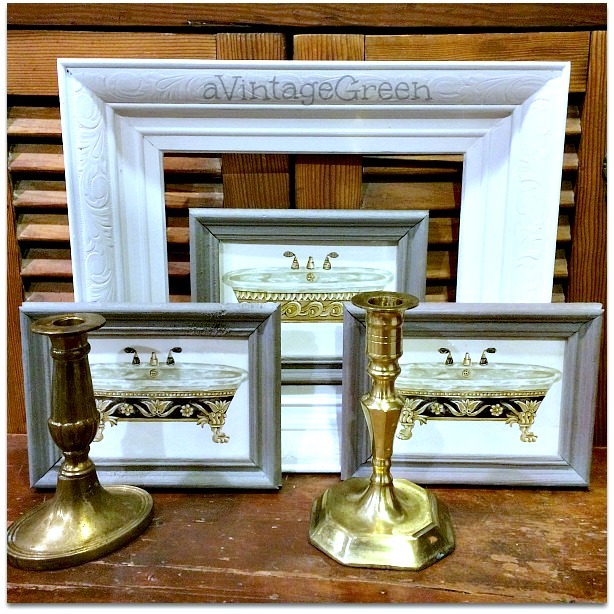 I upgraded the small grey bathtub pictures by adding brown paper to the backs, zigzag hooks and waxing/polishing the frames. The heavy brass candle sticks took a bit of cleaning too, wax removal and some polishing with a cloth (not with brass cleaner). The holly cream and sugar on a tray went into my booth and out with a new owner. 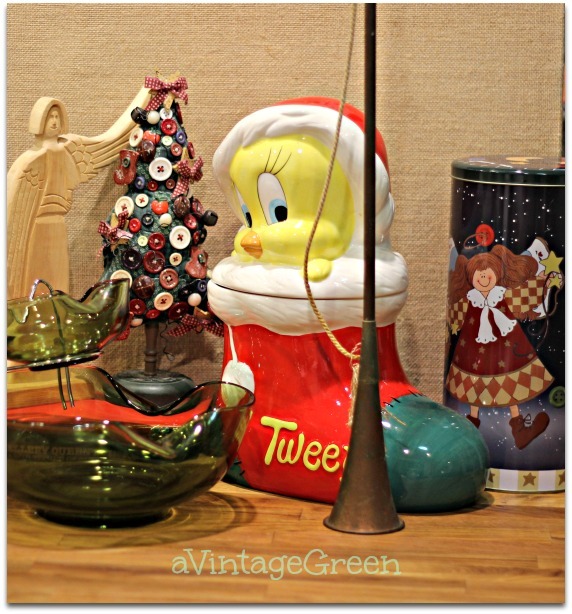 This grouping with a cheery Tweety cookie jar, button decorated cloth tree, carved wooden angel and a green chip and dip set along with a copper/brass horn and a Christmas tin are all in my booth. Again, the finds below are in my booth. The Burlap sign needed the frame touched up and waxed. The beaded Christmas decorations are displayed on a wire tree. The red glass comport and bells were good seasonal finds. The little dutch themed ornaments were found at another church sale, always looking for blue/white ornaments when thrifting. The green 'pepper' shaped cast iron pot was a nice surprise as was finding another mid-century green chip and dip set. Stoneware Cookie Jar was a (can you believe this) curb side find ! 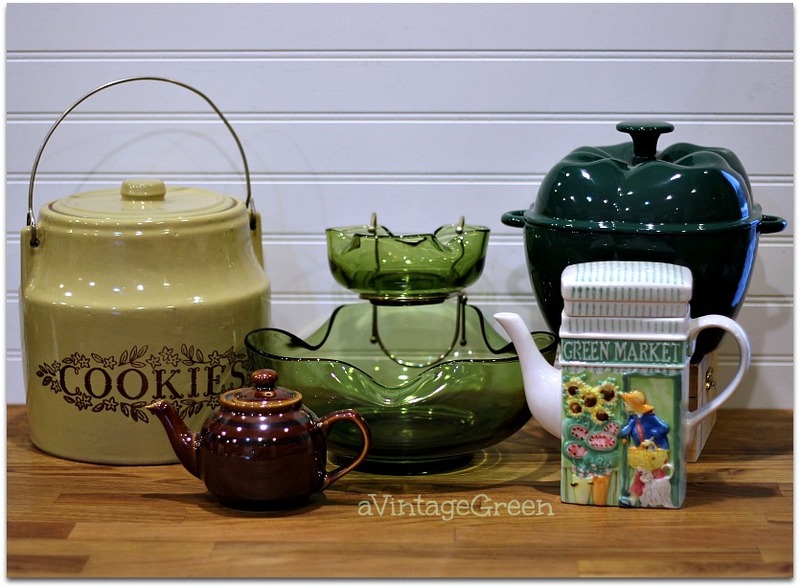 The Green Market teapot and the little 1 cup teapot were also found at the same sale. In my area garage sales are mostly finished until late February or early March. Church sales will be ending by the last Saturday in November. 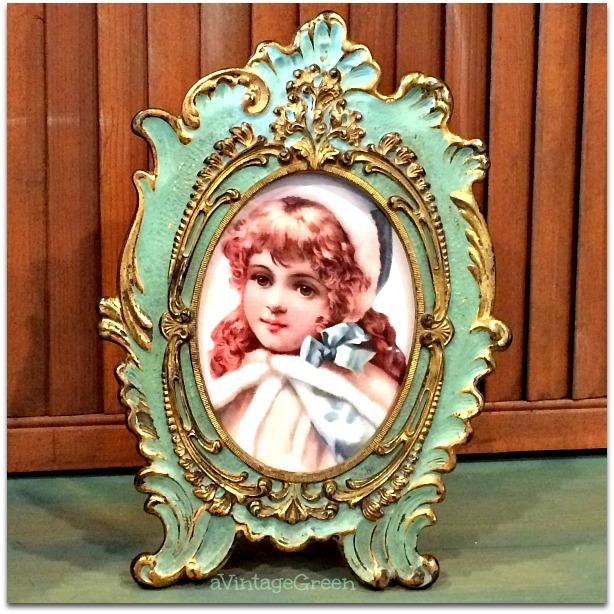 The thrift stores remain open and sometimes there are vintage items to be found. I use the quieter winter days to look around my home and storage sheds for earlier finds that suit the season. As well I work on repairing pieces, stencilling, cleaning and reorganizing my booth spaces, catching up on the paperwork that goes with having a reselling business and sometimes even sleep in on Saturday morning. Well, you found lots of little lovelies! You have found some great things! I like how you added that stencil design to the chair. That really gave it more personality. 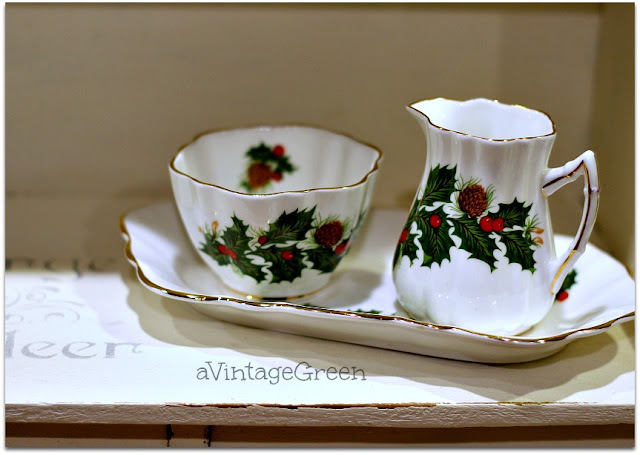 Love your stenciled items and you found some great vintage holiday items also. Church sales rock if you can find them! How lovely to visit your gorgeous blog and be delighted with so many wonderful finds. LOVE your curb find barn red chair. It is such a gorgeous shape and what a very cool stencil design. Love your red stool, Joy. It's so cute! I love chair you painted and stenciled. Have thing for different shaped chairs. Will look at our Michaels for that stencil. So glad to have clicked on your post. So many great treasures. What a beautiful chair to find! That's awesome that it came in that beautiful red color. Love ironstone too ... just can't pass it up. Thanks for sharing your fin finds. 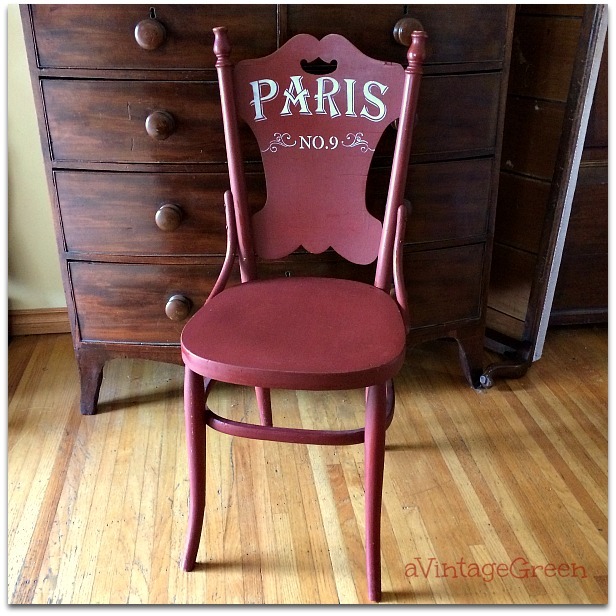 Joy, all of your finds are wonderful, but I am completely smitten with your red stenciled chair! Pinned! Thanks for sharing @Vintage Charm! So much fun to see your finds and to hear about the refurbishing. People do put some strange things on the curb, don't they! What fun finds! I love it when I find gems like that! Thanks for stopping by Funtastic Friday. I hope we'll see you again. Your barn red chair showed up just in time for Christmas. It will be a great place to display presents, throws, plants,... during the holidays. Thanks for sharing at Monday Social. I enjoyed my browse through your virtual "booth"... some amazing finds. the way we live doesn't allow us much space for collecting and I'm not crafty anyway, but one of the fun things I like about blogging is seeing how others live. And I especially enjoy vintage because many of these things remind me of my childhood...or even later (I guess I am rather a vintage person myself' if not a genuine antique). I always enjoy "shopping" your finds, this time I'd like the chair and the wooden angel, please. At least that's what would happen if I could visit your booth! Happy Mosaic Monday. Such cute groupings. I love that Eiffel tower picture/print. Nice work and repairs on your finds. Love your stencil work. Great finds as always! 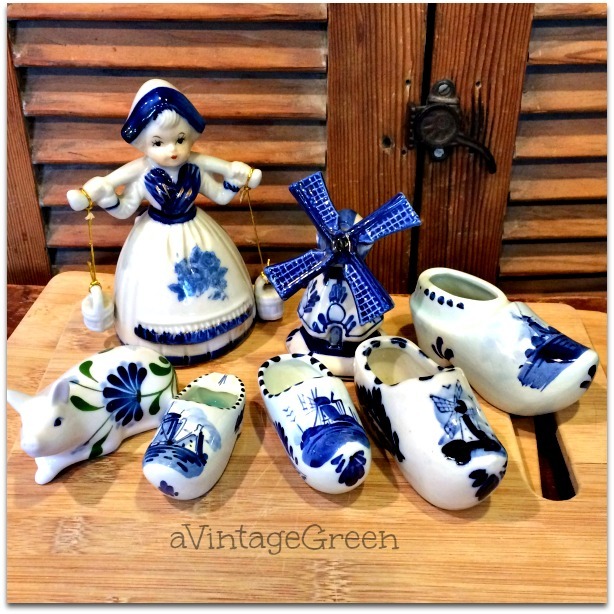 Love those blue and white pieces especially the little dutch girl and shoes. Hope you have a Happy Thanksgiving! Such pretty things with so much life left in them! Love the chair. You really do find the best "stuff" and make something special from all. The ironstone pitchers are charming. Thanks for sharing all your goodies at Monday Social. 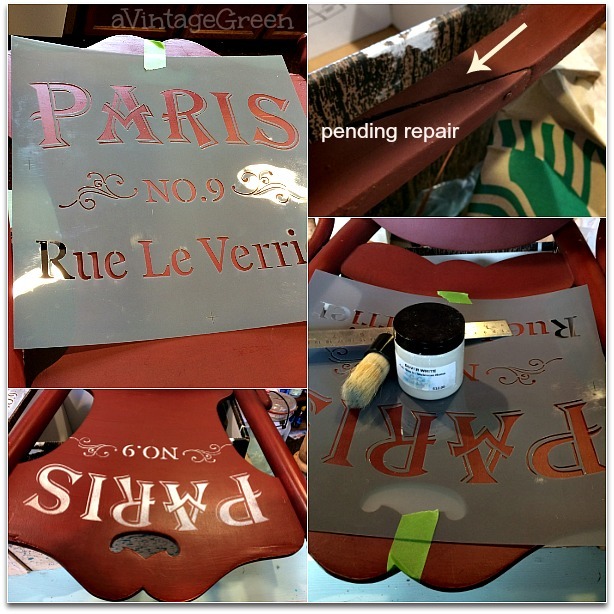 Joy, always love seeing your finds and your great stencil products. Amazing how the two ironstone pitchers look so similar, even though one is new. 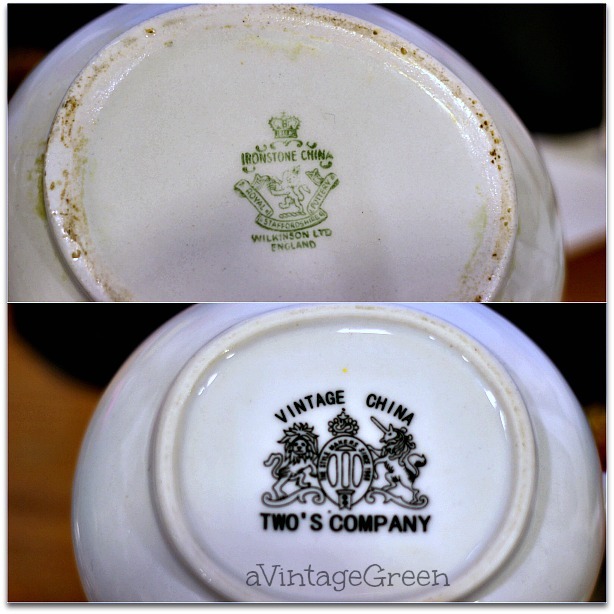 I almost never run across vintage ironstone. Thanks for sharing with SYC. Was intrigued by that beaded button tree - popped by from Dagmars. Fabulous finds Joy!! I particularly liked your stencilled barn red chair and will be featuring it at Shabbilicious Friday tomorrow. Hello Joy, You never cease to amaze me with your talent and wonderful treasures you find. Happy hunting. We have family for Thanksgiving and baking and cooking for company has kept me away from my computer. Thank you so much for your sweet comment. Love that stencil!! Thank you for sharing with us at the To Grandma's house we go link party, you will be featured tomorrow morning when the new party starts on Wednesday!